Tennessee has long been touted as a family vacation destination, and their abundance of family-style resorts proves it. 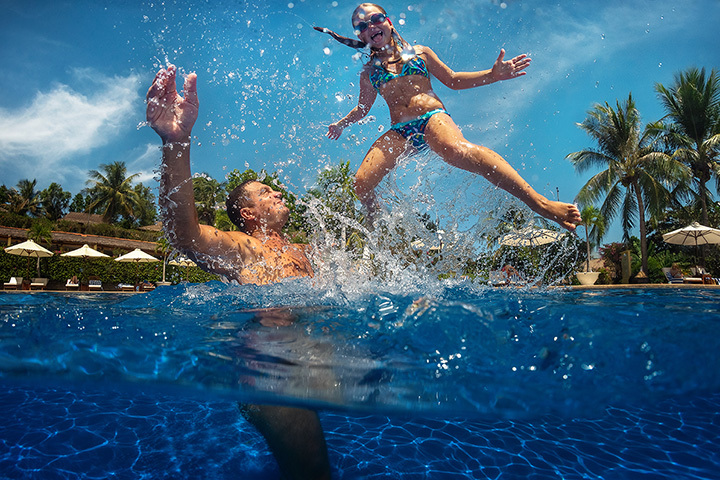 Finding a great resort that kids will love every bit as much as the adults will isn’t hard—they’re just about everywhere! Whether you love the mountains or the Mississippi, or somewhere in between, you’ll have the time of your life at these 10 best resorts for families in Tennessee. Perfect for kids and adults alike, the DreamMore resort is just a stone’s throw away from the famous Dollywood and Dolly’s Splash Country parks. The resort itself features an on-site pool, spa, and kid’s activities, plus you get door to door shuttle service to the parks. You can also score free early entry and beat the lines during your stay. No, this resort isn’t exactly a treehouse, but it’s close! Nestled just off the Parkway in the Great Smoky Mountains National Forest, you’re surrounded by beautiful natural scenery at every angle. The resort is chock full of kid-friendly amenities, including DVD players, free Wi-Fi, furnished kitchen, outdoor pools, kiddie pools, playground, and courts for shuffleboard and basketball. Tucked between Pigeon Forge and Sevierville right off the Parkway, this resort features an on-site water park (indoors AND outdoors!) complete with slides and splash area for kids of all ages. There’s plenty to do at the resort and surrounding areas, so you never have to venture far to have a good time. In addition to the free waterpark, you can enjoy the game room, playground, free Wi-Fi, and a full kitchen to accommodate your picky eaters. You’ve never seen anything quite as stunning as Big Cypress Lodge. The place gets its name from the treehouse-esque accommodations. Located inside the Bass Pro Shop pyramid, guests have access to bowling, restaurants, views of the alligator pond, and more. This place is truly amazing, and you won’t find anything like it anywhere else. Lakefront cottage camping? The choice is yours. This family-friendly camping resort offers beautiful lake vistas and plenty of activities, including kayak and paddleboard rentals, on-site dining, swimming pool, and playground. It’s a great escape to get away from it all. The largest resort of the Gaylord family, this epic adventure is in its own little world (literally). Atriums are designed to look like miniature weatherproof cities, and everything you could need for a family getaway can be found without leaving the property. There are tons of dining options, swimming pool, and even a kid-friendly spa. There’s no other camping resort in the Great Smoky Mountains as charming or entertaining as this one. The perfect balance of practicality and whimsy, kids and parents alike will appreciate the picturesque scenery and attention to detail. Notable attractions and amenities include fairytale cabins, riverside campsites, mini golf, horseshoes, a playground, pool, clubhouse, gem mining, pet area, movie theater, and ice cream parlor. You won’t find a more complete experience anywhere else. Tennessee’s best kept secret is this authentic dude ranch hidden just outside of Chattanooga. Every guest gets their own ranch horse upon check-in, and then the adventure begins. Enjoy horseback riding through the field, listen for the howls of coyotes, or enjoy a visit to the pool. This experience is a rare gem, and one you’ll want to discover again and again. Part marina, part resort, you’ll love a vacation on the lake. Guests love this place because of its beautiful lake views and super clean rooms. You can rent a boat from the marina and spend the day on the water fishing, swimming, or enjoying some quality family time. This modest resort and convention center is in the heart of everything you want to experience in Pigeon Forge. Take your pick of the hotel or inn, where you’ll find larger-than-average rooms, private balconies, and breathtaking views. You can also score deals on other area attractions for less than what you’d pay at the ticket window.